Thursday, May 5, 2016. 12:30 to 2 p.m. In this symposium, Professors Nicola Denzey Lewis and Jessica Dello Russo will consider the latest research on the Christian catacombs of ancient Rome. 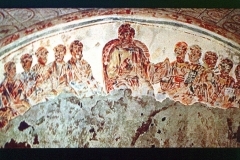 By presenting the results of their archaeological studies in Roman subterranean catacombs, both Professors Denzey Lewis and Dello Russo will reveal surprising features of Christian burial practices of earlier and later antiquity, which suggest otherwise unrecognized features of popular religion in ancient Rome and beyond. Nicola Denzey Lewis is visiting associate professor of religious studies at Brown University, an International Catacomb Society director, and former Shohet fellow. She works on the intellectual and social history of Christianization in the context of the Roman Empire, with special attention to Gnosticism, “lived religion,” and practices around death and burial. The author of three books and one edited volume, Denzey Lewis’s next projects include Ordinary Christianity: Lived Religion in the Age of Constantine and another book on the early Modern invention of the “Christian” catacombs of Rome. Jessica Dello Russo is executive director of the International Catacomb Society, a non-profit organization for the documentation of societies and cultures of the ancient Mediterranean, and a doctoral candidate at the Vatican’s Institute for Christian Archaeology in Rome.